Genuine Tumzee! Your Baby Has Never Experienced Tummy Time Like This! According to the Pediatric Society babies should always sleep on their backs which reduces the risk of Sudden Infant Death Syndrome (SIDS). This can cause Positional Plagiocephaly (flat head syndrome). This is why it is so important for babies to receive supervised Tummy Time to encourage proper development and growth. Reducing frustration during Tummy Time making it a more pleasant experience. Allowing baby to spend more time on his stomach developing neck, back and arm muscles. Allowing baby to see the surrounding environment and playing with toys while working on fine motor skills. Tumzee® has been designed for babies from birth to crawling age. This unique design enables babies to be positioned on their tummies on an incline, which assists in reducing the frustration many babies experience during Tummy Time. 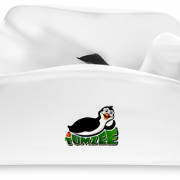 Tumzee® has a “T” support which prevents babies from sliding out. Since they are propped up they are able to see the surrounding environment and play with toys which may help in developing neck and back muscles as well. Tumzee® is made of Polypropylene with the “T” support. It has the softness required for infants to be comfortable laying on it but the firmness necessary to support their weight. No other product on the market offers the stability and support that may help prevent the baby from sliding down, rolling out or off of the product. Super Excited-Derek’s TUMZEE got here today, I ripped it open & he’s already used it, I think he really liked it.. I love it!! I think it’s a must have,wish I would’ve known about them months ago! My son loves having tummy time on his tumzee. And can hold his head up really well, and he’s almost sitting too at 3 1/2 months cause of the strong muscles he’s developed because of how much he uses his Tumzee. It’s a great product! And I’ve reccomended it to all of my friends with a new baby! My 13 week old having tummy time with the help of his Tumzee that we won with the last giveaway – without crying a single tear! Thanks Tumzee! The Tumzee was given to us as a gift for our first child. Our son never quite enjoyed tummy time so we were thrilled when we placed him in the Tumzee and he spent time playing with a smile on his face! 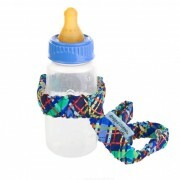 We recommend the Tumzee as a helpful and beneficial tool for any baby. My son is only 5 months old. He use to hate being on his tummy. He would lay on his tummy and start crying within 2 or 3 minutes of my putting him down. I am so thankful for the tumzee. My son now loves to play on his tummy, thanks to the awesome tumzee. The tumzee is made of the a similar materiel to the bumbo chair. 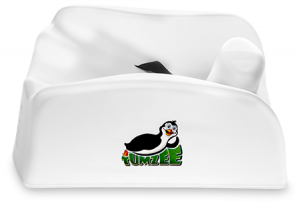 The tumzee is a really great thing to have for your baby. My son will playin his tummy for around 20 to 30 minutes at a time. I simply put him in the tumzee and put his toys in front of him and he will play with his toys and laugh and smile now, instead of crying. I will recomend the tumzee to anyone and everyone I know with a baby. make sure to enter below for your chance to win a tumzee of your own. head over and check out all of the beautiful colors of the tumzee, then come back and enter to win one of your own. The day after we brought Baby C home from the hospital we read through the discharge papers and it said to start tummy time as early as 2 weeks. I was hesitant because Baby C was so tiny but my husband said, “he’ll be fine” and put Baby C on his belly at 2 1/2 weeks. Baby C did great and he actually didn’t mind it but only for 5-10 minutes. Fast forward to a couple months later and he would tolerate tummy time for about 10-15 minutes before he started to fuss and get frustrated. We recently learned about the Tumzee from PTPA (Parent Tested Parent Approved). Have you heard of it? Well, we didn’t either until a few weeks ago! We were skeptical at first because it looked like another gimmicky product but we tried it and he loved being in it. It is a simple design but he was able to comfortably play on his tummy for at least 30 minutes. He loved being in it because for the first time he was able to grab his toys, pick them up and press the buttons on his Leap Frog ABC dinosaur. The way the Tumzee is angled allowed Baby C to play without getting frustrated. Baby C is 5 months and we are still using it. The favorite thing about the Tumzee is that it was created by parents! I truly believe that parents know best and they make the best products for kids! We had our friend’s 3 month old try it out and she liked it too! I wish we learned about it sooner! Moms, dads, or need a baby shower gift? You should definitely check out the Tumzee! It’s a Parent Tested Parent Approved award winner!